Special investigators on Wednesday questioned a close aide to President Moon Jae-in in connection with an online opinion-rigging scandal involving a power blogger. 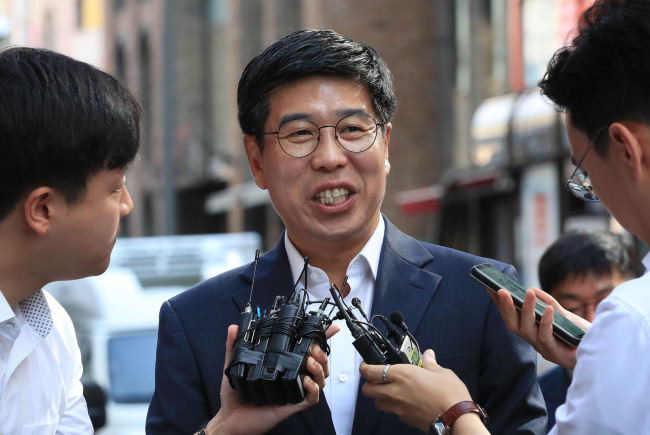 Baek Won-woo, a presidential secretary of civil affairs, appeared at the office of the independent counsel in the morning for interrogation over his relationship with the influential blogger, known by the nickname Druking, who has been arrested for manipulating online comments on political issues ahead of key elections. Baek is known to have met with a lawyer whom Druking recommended for the consul general post in Osaka after Moon's election victory last year. Druking made the request to Kim Kyoung-soo, then a ruling party lawmaker and now governor of South Gyeongsang Province. Kim delivered the recommendation to the presidential office, which turned it down. "I will faithfully undergo the probe," Baek told reporters at the independent counsel's office. When asked what he discussed with the lawyer, the secretary just said, "I will tell the special investigators (about the issue)." Gov. Kim has been summoned twice over allegations that he frequently communicated with Druking and his crew to carry out the scheme to rig the number of likes on news articles to benefit the ruling Democratic Party in late 2016, when the DP was the main opposition. Kim has said that he has committed no wrongdoing.